The Royal Swedish Academy of Sciences awarded the 2006 Nobel Prize in Economics to Edmund S. Phelps. His work on the expectations-augmented Phillips Curve revolutionized the way economists and policymakers view the relationship between inflation and unemployment. Most economists in the 1960s believed that there was a permanent trade-off between inflation and unemployment, and they referred to this relationship as the Phillips Curve. The Phillips Curve made policymakers' jobs very easy. If unemployment was too high, then Congress could increase spending and the Federal Reserve could print more money. Higher spending and a larger money supply would raise the inflation rate and bring down the unemployment rate. Hence, the purpose of fiscal and monetary policy was to pick the optimal rate for inflation and unemployment. Phelps's work suggested that the perceived trade-off between unemployment and inflation was only temporary. It also suggested that there would always be some unemployment--the natural rate of unemployment--due to frictions in the labor market. In the long run, Phelps argued, the trade-off between unemployment and inflation disappears--the unemployment rate returns to its natural rate, regardless of the inflation rate. Hence, the modern purpose of fiscal and monetary policy is to pick the optimal path for inflation and unemployment. The following is a mathematical interpretation of the expectations-augmented Phillips Curve. The actual inflation rate is dependent on two factors: the expected inflation rate and the unemployment gap (the difference between the actual unemployment rate and the natural rate of unemployment). During the 1960s, economists observed a nice, smooth downward-sloping relationship between the inflation rate and the unemployment rate because expected inflation was constant. However, soon after the 1960s, expected inflation began to converge with the actual inflation rate (the short-run Phillips Curve shifted to the right). We no longer observe a smooth downward-sloping relationship when the expected inflation rate changes. Phelps argued that in the long run, expected inflation equals actual inflation. Now, let’s look back at the equation. If actual inflation equals expected inflation, then the unemployment rate must equal the natural rate of unemployment. Therefore, in the long run, Congress and the Fed cannot affect unemployment through spending or printing more money. 1. Some economists have argued that the natural rate of unemployment increased in the 1970s, which led to misguided monetary policy. 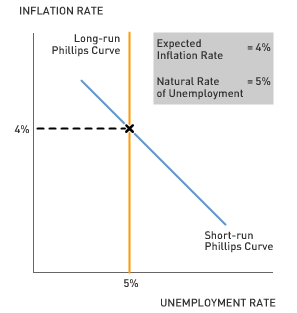 Use the short-run and long-run Phillips curves to show how a Fed that believes that there is a permanent trade-off between inflation and unemployment would inadvertently increase inflation without affecting the long-run unemployment rate. 2. Why is it important that the Fed targets an inflation rate rather than an unemployment rate? Of course, all that is only useful if we can know in advance what the natural rate of unemployment actually is. Having lived through the revolution, I can say that the idea was an extremely important change in our thinking. But also that way too many economists tended to believe that the natural rate of unemployment just happened to equal the actual rate of unemployment.